Chipotle Mexican Grill is a Mexican, Grill, and Gluten Free restaurant where most Menuism users came for a meal on the go, paid between $10 and $25, and tipped less than 15%. 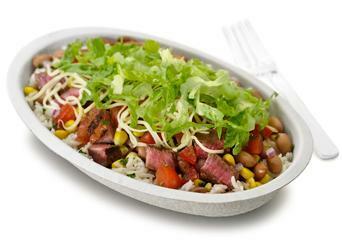 1 review of Chipotle Mexican Grill, first by BalancedFork. I am impressed with Chipotle’s commitment to serving healthy meats (no hormones, etc.) and still maintain great prices. I always get the burrito bowl (low carb) and it never disappoints. On this occasion, there was a little mishap, but I won’t hold it against the store – life happens, and the food was great. I got the burrito bowl with barbacoa (seasoned beef) along with brown rice and both black & pinto beans, topped with onions & peppers, lots of pico de gallo and a little sour cream and cheese. We got guacamole on the side just to round it off. Are you hungry yet? Chipotle Mexican Grill is located near the cities of Suntree. People found this by searching for: Chipotle 85286, Tipping At Chipotle, Chipotle 85286 Gilbert Sunday, Chipotle Gilbert San Tan, Does Chipotle Mexican Grill Get Paid Weekly, and Chipotle Mexican Grill, S Gilbert Rd, Gilbert, Az Review.